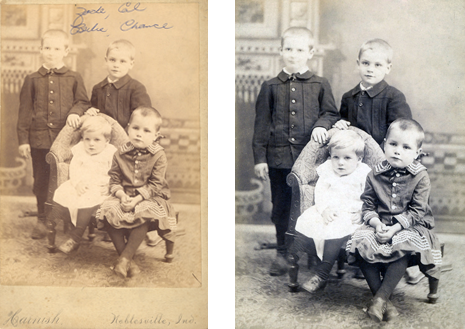 Restore your special photo today! To keep things as simple as possible, there are three main restoration categories: Basic, Medium, and Complex (see examples below). If you are struggling to decide which of the categories your request falls under, just contact us with the detail and we can give you an estimate. If you have placed your request in the wrong category when we receive your order, we will inform you before work starts. 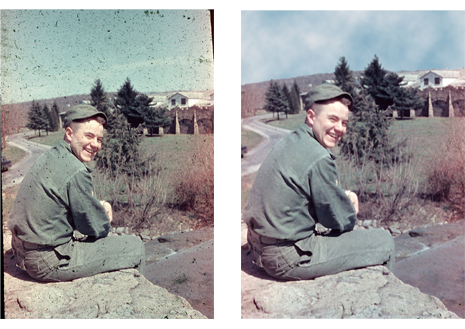 Suitable for photos with minor damage or blemishes, our basic restoration package includes a scan of the photograph, cropping, red-eye removal, minor blemish removal, and minor color improvement. 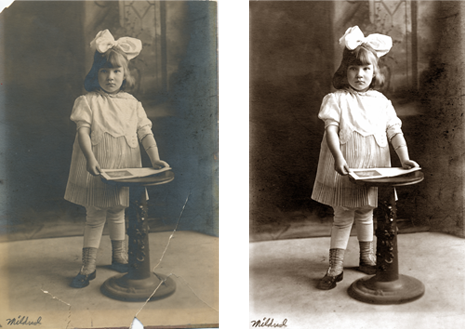 For photos with a little more wear and tear, our medium restoration package includes a scan of the photograph, cropping, red-eye removal, medium scratch and blemish removal, image enlargement, medium color improvement, and simple object removal. Ideal for heavily damaged photos or for removing unsightly people or objects, our complex restoration package includes a scan of the photograph, cropping, red-eye removal, complex scratch and blemish removal, image enlargement/reduction, major color improvement, tear repair, and complex object removal.